As a rule Ebay does not allow buyers to cancel their bids, in order to protect the sellers from incurring fees without actually making a sale. Every bid is considered a contract and you are obligated to buy the item, unless it is listed under a “non-binding bid policy” category. In case of an honest mistake however, you can request a cancellation if the conditions and time restrictions apply. Please note that once you retract a bid, it can no longer be reinstated. 1. You accidentally bid the wrong amount. If this occurred, re-enter the correct amount immediately. 2. The description of an item you bid on has changed significantly. 3. You cannot reach the seller by phone or by email. Send a message to the seller, explaining politely why you want to cancel your bid. Be honest and nice. Remember that you are asking the seller for a favour. The final decision for the cancellation is up to the seller. 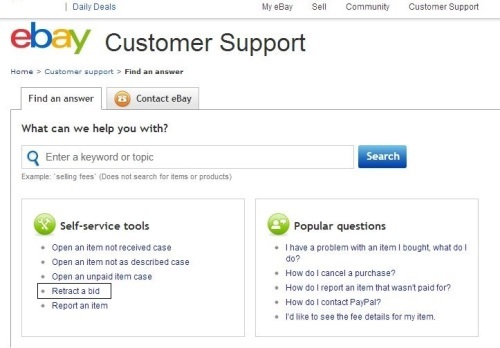 If the seller decides to refuse to cancel your bid, you need to file a formal bid retraction with eBay. Under Customer Support select Retract A bid. In the next screen select the item you want to cancel and click continue. From the dropdown menu, choose a reason for your retraction and click retract bid. Always be very careful when placing bids and don’t bid impulsively. Ebay and the individual sellers can refuse your request for cancellation or retraction if they feel that you don’t have a legitimate reason or that you are trying to cheat the system.